During the First World War, Ashton was rocked by a huge explosion in a local ammunition factory. On June 13th 1917, the explosion occurred at the factory of Hooley Hill Rubber and Chemical Works on William Street in Ashton's West End. The factory was producing TNT for bombs. Forty-three people lost their lives in the explosion and hundreds more were injured. The explosion took place at 4.20 pm when many schoolchildren were on their way home. One of those who died was a child swimming when glass in the roof of the Swimming Baths was blown in. The blast blew out windows as far away as Dukinfield and Hurst. Over a hundred people were made homeless. Hundreds of people living near the works were made temporarily homeless and were accommodated in nearby schools. Inside St Peter's Primary School is a brass plaque commemorating the seven pupils from that school who died in the explosion while on their way home from school. A sculpture in memory of all those who died in the explosion has been erected in Henry Square, near the old swimming baths. 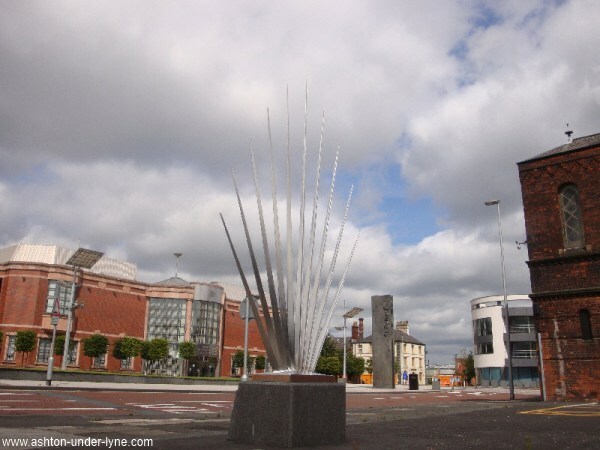 it is a stainless steel work by sculptor Paul Margett. Ashton Munitions Explosion Scuplture in Henry Square. Visit the Local History index page to find out about more about places and events in Ashton.